My husband is a complete pie addict. The first Christmas we were married, he gave me a cookbook called “365 Great Cakes and Pies.” Hint, hint! So far, I’ve only made a grand total of two pies from the book. Talk about a let down! 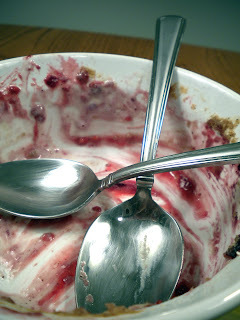 A whole pie is an awful lot of dessert to have sitting around a house occupied by a chronic calorie watcher. So, I tried to come up with something that would satisfy both a pie lover and diet guru alike. Every time I go out to eat in a restaurant, if I manage to save room for a few bites of dessert, I always go for the fruit option. I love chocolate, but it’s really rich after a big meal. For some reason, fruit feels lighter to me. I’m sure this is all in my head, but I’m fine with entertaining a delusion or two. 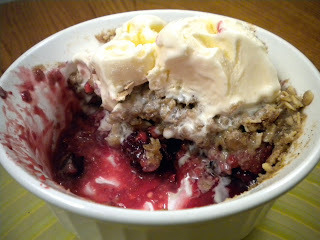 When you’re making dessert at home, a fruit crisp is a lighter alternative to a traditional fruit pie. 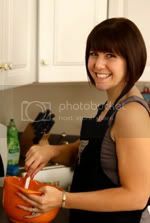 It’s also much quicker and easier to prepare. Instead of the fruit being completely enveloped in crust, there’s just a light sprinkling of crunchy topping. 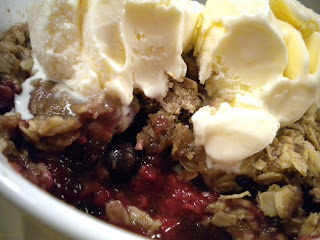 I decided to try a MIXED BERRY CRISP since berries are in season right now. Berries are also the best choice for low-carb diets. On top of being low in sugar, they’re rich in vitamins and antioxidants. When I made this the first time, the fruit was really soupy and runny. I tried it again, lightly tossing the berries in cornstarch. That did the trick. The filling was still warm and gooey, but didn’t run all over the plate. I make a mini portion in a 16oz ramekin that serves two. This way, we eat it once and it’s over and done with; going, going, gone. No tempting leftovers to test my willpower. Dessert should always be thought of as a treat. This is intended to be lighter than a pie, but it’s still dessert and should be enjoyed sparingly. The crisp is more of a method than a recipe. You can swap out the berries for any fruit you like. You can add or decrease the amount of oats or sugar to your taste. Feel free to double or triple the recipe and make it in a large baking dish for a big group. 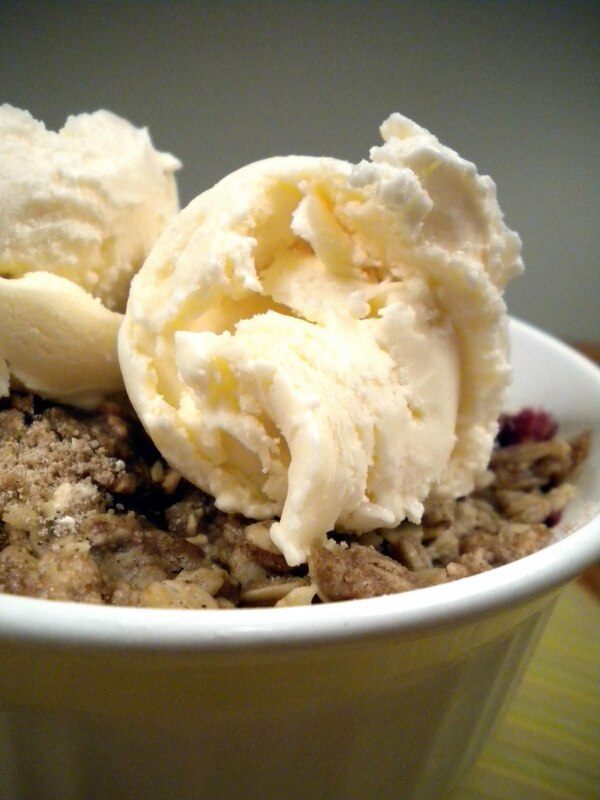 I topped my crisp with a scoop of light vanilla ice cream. 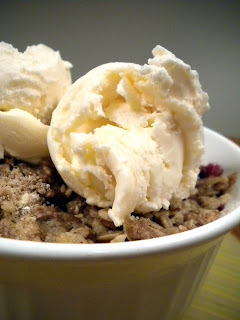 Whatever you decide to try, I guarantee you won’t miss mom’s apple pie (too much)! Got to taste this a few weeks back and can attest to the fact that it is DELICIOUS. Love me some fruit crisp ala mode.